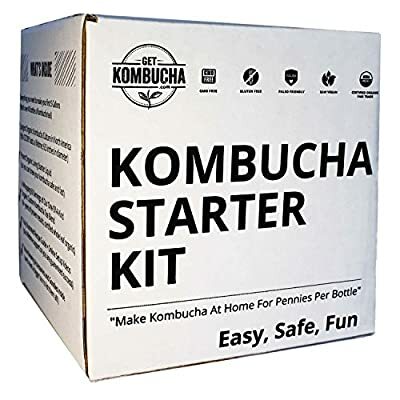 Kombucha Brewing Starter Kit: 6.5" Organic SCOBY, Largest USDA Culture In North America, Organic Loose Leaf Tea Brew 80 Bottles, Organic Sugar, Instructions, Videos, Recipes, Supplies and More! Includes all the ingredients needed to make 2 Gallons of kombucha and enough organic kombucha tea blend to make 5 gallons... that's 80 bottles of kombucha! 6.5 inches in diameter and up to 1 inch thick...that's over 7 times as large as others!. Our kombucha scoby mushroom cultures are kombucha mothers which mean they are ready to make kombucha mushroom tea the very first time. 10 years in business and 42,394 kits sold... Read the reviews, we are crazy about your brewing success. Lifetime customer support and full access to our kombucha video library packed with 120 faqs and easy video tips to turn you into a kombucha pro! WHY SMART KOMBUCHA DRINKERS LOVE THIS KIT MOST. 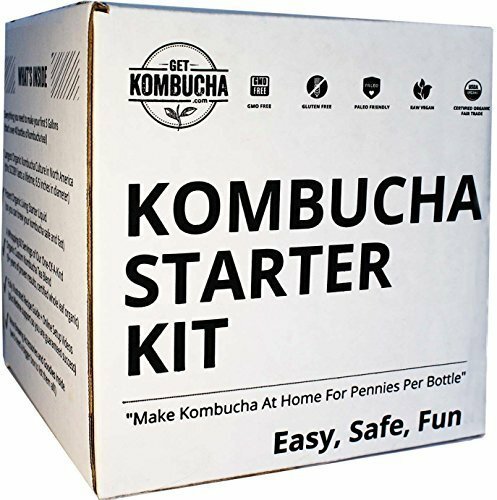 Since 2006 This Kombucha Kit Has Helped 42,492 Kombucha Drinkers Become Successful Kombucha Brewers... You Can Do This!. AMAZON APPRECIATION BONUS. Purchase This Kit On Amazon And Get Double The Amount Of Brewing Accessories 2x Covers 2x Bands and 2x Tea Filters! *** Limited Time Only ***. BETTER INGREDIENTS... AND MORE OF THEM. 120 Grams Of Certified Organic Kombucha Tea Blend 8 times more than other kits selling at the same price . Makes 80 Bottles Of Kombucha Tea For You And Your Entire Family All You Need Is A Gallon Jar To Brew In And Some Water SIZE DOES MATTER. 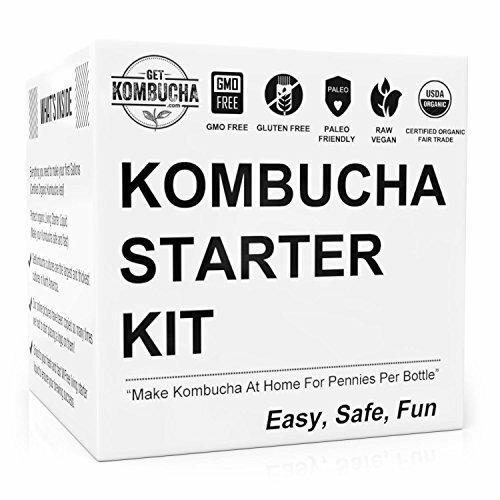 While Others Have You Attempting To Make Kombucha Using A Small Dehydrated Disc The Size Of An Oreo Cookie This Kit Includes North America's Largest Living Kombucha Culture 6.5 Inches In Diameter So You Can Have Your Homemade Kombucha Flavors In Half The Time. 100 "BANANA PANCAKES" GUARANTEE. We Believe Making Kombucha Tea At Home Should Be Easier Than Making Banana Pancakes. And With Our World Class Customer Support Via Email Phone or Skype We Guarantee You Will Too!.